Really national standard is located at the Tour-Business center of Ho Chi Minh City, 1km from Ben Thanh market, and is an ideal place for Relaxing, Sightseeing, Tourist, Shopping and Displacement from travelers. 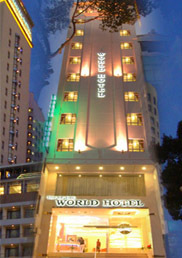 The newly opened TOP OF THE WORLD Hotel offers first-class accommodations of international standards. Our 59 guest rooms are tastefully decorated and designed to provide maximum comfort and convenience, with the most modern American standard fire alarm system. TOP OF THE WORLD Hotel offers a sophisticated restaurant to serve breakfast, lunch and dinner. The restaurant offers an outstanding Western and Asian menu, with specialty in traditional Northern, Central and Southern Vietnamese cuisine. The foods are skillfully prepared by our professional. Trained chefs and staff.